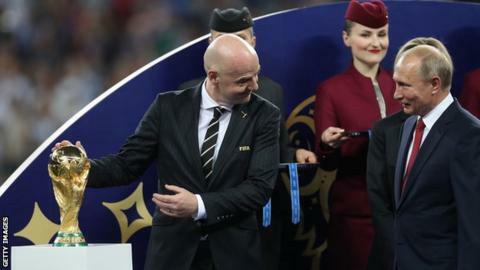 Infantino said it was Fifa's duty to "protect football"
Players involved in any European Super League would be banned from playing international football, including the World Cup, says Fifa president Gianni Infantino. German publication Der Spiegel claimed top European clubs held secret talks to create a such a set-up by 2021. The news magazine said leaked documents revealed clubs' plans to leave their national leagues and associations. Infantino said it was Fifa's duty to "protect football". He also said Fifa's own plans for a Club World Cup was "the answer to any attempt to break away from the leagues" because it would "generate much more revenues for the clubs but also much more revenues for solidarity". "We have seen for many years these attempts to break away outside of the structures, going back to the 1990s," he added. "You are either in or you are out. If there are players who don't play organised football then that encompasses everything - national leagues, confederation competitions, the Euros and the World Cup. "It is up to us to protect football and come up with solutions that benefit clubs and also the world football community." Der Spiegel also said the documents it obtained showed Manchester City and Paris St-Germain overvalued sponsorship deals to help meet Uefa's Financial Fair Play rules. It alleged that in 2014 the clubs negotiated with Infantino, who was then general secretary of Uefa, to agree reduced punishments. City have said they will not be commenting on the claims. Paris St-Germain have been contacted for a response. Addressing the claims, Infantino said: "We were doing our job and saved the system and we saved European club football. "We worked with the information we had at the time. If new information has come out, I'm sure Uefa will look at it." Will 2022 World Cup in Qatar be a 48-team tournament? Meanwhile, Infantino said the chances of expanding the 2022 World Cup in Qatar to 48 teams is "certainly small" but discussions to do so will continue. "I was positive about it from the beginning because I think if we can increase the number of teams it is good for football," he said. "That is why we are going to do it for the 2026 World Cup. "Can we do it for 2022? It is a difficult challenge." A final decision on the issue will be made at the next Fifa council meeting in Miami in March and Infantino suggested Qatar could share the tournament with its neighbouring countries. However, that could be difficult considering Qatar is involved in a stand-off with Bahrain, Saudi Arabia and the United Arab Emirates. "We are in discussions with Qatar," said Infantino. "It will be a very, very difficult challenge to do it only in Qatar. "So personally, as president of Fifa, I would be very happy if some matches could be shared with some countries in the region." He added: "In the light of current circumstances in the region I would be even happier if it could happen. "Football unites, builds bridges, that could be a concrete result. "What are the chances? Certainly small but what is wrong in discussing it?"